You may not think it, but having a shower with luxury design, quality water pressure and extra comfort features make a big difference. If your bathroom is next on the renovation list, it’s wise to research the latest trends for everything from the first idea to the final touches. So, take your home’s bathroom to the next level with one or more of these 5 shower trends. Avoid accumulating grime and mold on your shower entrance by removing it completely. 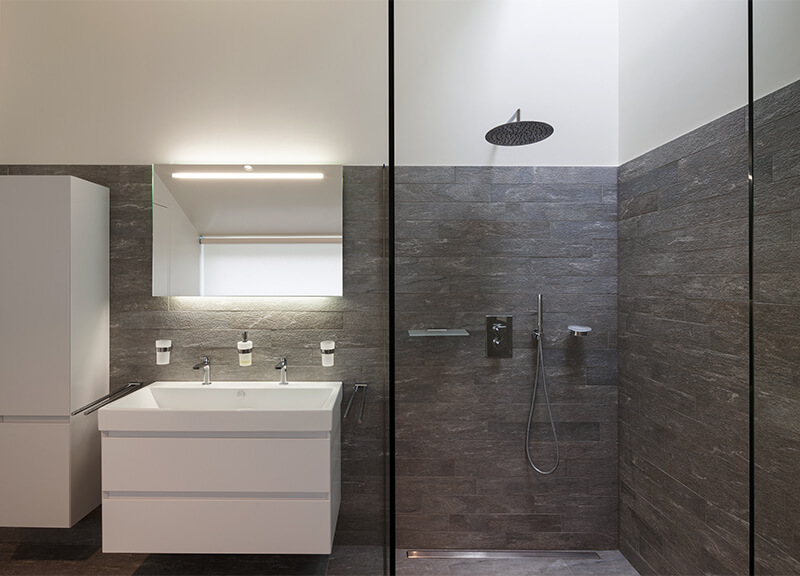 Open-concept or walk-in showers promote movement and flow throughout your bathroom space. Not to mention, they effectively eliminate the close-quartered feeling that standard showers offer. Open-concept showers can still be separated from the rest of the bathroom, too. After all, a well-placed wall can deliver privacy and a place to mount your shower head. Make your bathroom stand out with a multiple shower head design. Dual shower heads give the shower space a more balanced feel. Plus, many models allow you to change the water pressure for a versatile wash. While one sprays gently, the other can deliver a harder, massage-like burst of water. Also, having a second, detachable shower head can promote a more handicap-accessible bathing area. Overall, multiple shower heads are great for increasing the appeal of your home. Enjoy the natural feel of rainfall every day with a rain shower head. Many rain shower heads deliver a wide coverage and low water pressure to give you a gentle, relaxing spray. On the other hand, these heads also avoid the bulk of shower heads mounted to walls. Even more, they promote an elegant design that draws your eye from the floor to the ceiling. Even if the rest of your bathroom is well-lit, isolated showers may not receive the benefits of these lighting fixtures. While functional and beautiful, mood lighting built into your shower area heightens visibility and creates a dramatic ambiance. Moreover, for a modern look, consider creating a pattern of lights on the ceiling that highlights your shower head and the surrounding walls. Bring your love of urban design into the home with clean-cut subway tiling. As a trend proven to stand the test of time, subway tiling is sure to deliver a lasting look. And, because the tile is so versatile it will work with a variety of bathroom types. Uniquely, when used as a backdrop, this trendy tile will also enhance the style and design of your other bathroom hardware. Visit our Kitchen and Bath Design Center to learn more about the hardware we provide. Established in 1903, our family-owned business has helped many Maryland homeowners with their latest projects. Contact us online or at (410) 827-8811 to schedule a quote today.